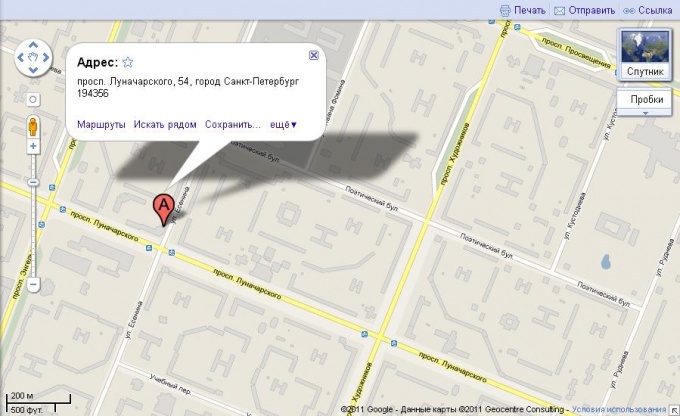 How to download google map, yandex in high resolution? To save a little Google maps in several ways. Usually they are quite simple, and this possibility is provided by the Google project. There are several solutions for the given task. Will work on a concrete example. Suppose we want to find on the map a certain house and keep this piece of card. In the search bar http://maps.google.ru/ input we need the query. For example, take the address Saint-Petersburg, prospect Lunacharskogo, 54. Google tells us searched the house of the red drop, and displays a window with information about the object. In this case, the Address: prospect Lunacharskogo, 54, Saint Petersburg, 194356. Below – "Routes", "Find next", "Save", "still", in which the same few paragraphs. Save card several. Here is one of them. Open the select "more" and click on the link "Send". In that appears over the map window, select the "send email". In the box "to" enter your email address and click "Send". The letter comes immediately. It is a picture of that area of the map you have chosen. To save it to your computer, click on the picture, right-click and select "Save image as". Choose the directory (folder) where you want to save the image, click "Save". If you want without all this hassle just to print a map, click the print link in the upper right corner of the map. This will open a new browser window ready to print the desired piece of card. Then "File" – "Print" (or, instead, a simple Ctrl+P) and click the "OK"button. And the most frequently used method. With an open browser window tab, with the desired section of the map, click on the keyboard button Print Screen (on many laptops the PrtSc or Prt Scrn). This button makes a screenshot of your monitor. Now open "start" – "All programs" – "Accessories" – "Paint" (start – > Run – > "mspaint" and click the "OK" button). Open the program window. The "edit" – "Paste" (or Ctrl+V). The program window appears you take a screenshot. Select the selection tool and draw out the piece images that we need, and then click Ctrl+C (this means copy). Find the lower right corner of the whole screenshot, direct the cursor with the mouse and using the tool that appears "arrow" (which will turn the cursor), "contractible" screenshot to the upper left corner. Now click Ctrl+V (which means paste) and get a full picture. Now it only remains to save it to your computer, click "File" – "Save as". Select the desired directory (folder), enter the file Name or remains the same, select the file Type (recommended in this case JPG).